Horror movies, particularly zombie films, are often discarded as mere entertainment, derivative pulp, or fanboy escapism. This is undoubtedly sometimes true, but just as often horror films reward deeper examination with a clearer understanding of some of our underlying fears and anxieties. Zombie films, a subgenre that catches more flack than most, have held on and in fact grown in popularity for eighty years now, and it’s difficult to dismiss such a long-lasting and prolific body of work without first examining what the appeal of these films tells us about ourselves. Zombie films rub against our belief in the inviolable sanctity of the human body, perhaps most especially in death. Though the first zombie films emerged in the decade prior to World War II, they reached their pinnacle in the late 1960s and 1970s, most notably under the low-budget direction of George A. Romero, the cult legend behind Night of the Living Dead among others. It doesn’t seem like a coincidence zombie films reached new levels of popularity during the Vietnam War. In these years young male bodies, long our patriarchal society’s image for human strength and virility, were being brutalized, butchered and piled up on the evening news. For the first time gory visual reminders of our mortality were being broadcast to American living rooms whether families wanted to see them or not. War, and more specifically the bloody and visceral consequences upon human bodies during battle, was no longer something that happened out of sight, sanitized upon return under draped flags and crisp formal uniforms. I don’t think it’s a coincidence zombie films (and other uniquely gory horror genres) reached their zenith among American young adults during this era, especially since the zombie film is unique among horror genres in that most of the time it involves a dose of absurd humor. From an evolutionary standpoint, laughter is a method of shedding stress in the face of real or imagined danger to ourselves or others. Young bodies were being mangled on the evening news, and they were being mangled in zombie films, but the latter allowed young people to laugh about it, and to feel safer in comparison to the absurdity happening on screen. Additionally, the hoards of mindless undead bodies on screen often served as social commentary on the sedated consumers of our Western society’s runaway capitalism. 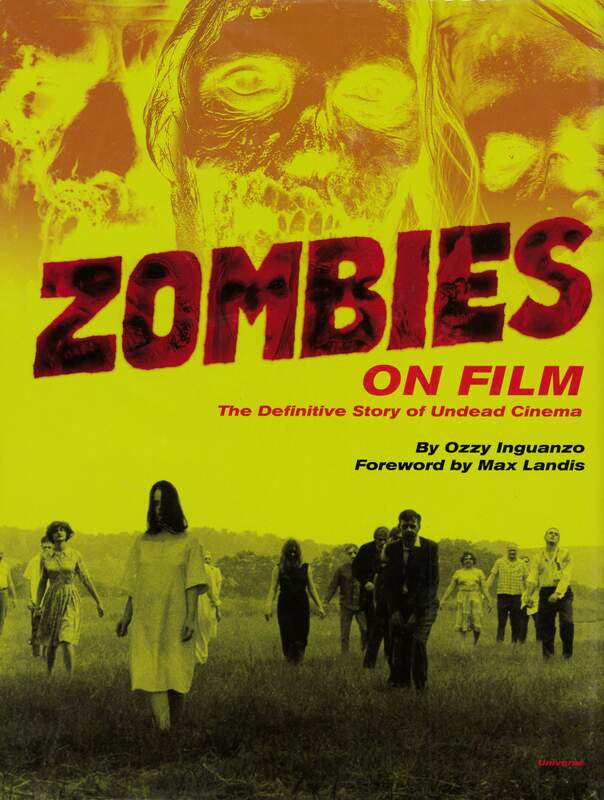 Ozzy Inguanzo’s new book Zombies on Film: The Definitive Story of Undead Cinema (791.43 Inguanzo) is both a wonderful and nearly exhaustive history of the zombie film genre since its origins in the early 1930s and also a survey of the major themes and possible deeper meanings within these movies. The book moves chronologically from those first zombie pictures through the decades as filmmakers experimented and the genre evolved into what we understand it to be today. Extensively illustrated with film stills, classic posters, and production photos, this book is a visual smorgasbord for horror fans for its images alone, though Inguanzo’s researched history makes it far more than that. Rather than devote a disproportionate number of pages to the golden era of the 1960s through 1980s, Inguanzo recognizes the importance of even the lesser-explored eras of the genre’s history, neither ignoring the early years as dry nor dismissing the last two decades as the product of mainstream sellout. 1932’s White Zombie, 1978’s Dawn of the Dead, and AMC’s current hit television show The Walking Dead all receive attention. This reviewer (who would like to consider himself something of a movie snob and film history buff) discovered underground titles he’d never heard of, making Zombies on Film a great viewing guide to those who want to make sure they see everything this genre has to offer. This book is not to be missed for any fan of horror movies, and is also a worthwhile read for fans of film history and appreciation in general. For those who love Hollywood history but find zombie fare less than appealing, GPL has a wonderful new book in by Steven Bingen titled Warner Bros.: Hollywood’s Ultimate Backlot (791.43 Bingen). Warner Bros. is both a fascinating history of one of Hollywood’s largest movie studios and a trip inside the modern studio to understand how some of our favorite movies get made. Bingen, a former employee of the titular studio, has extensively researched his subject and provides a wealth of information within his pages. The book is illustrated with many black and white production photos from early decades and color images from recent ones, as well as maps of the studio’s sprawling layout over the years. While information in later chapters about film productions from recent years is interesting, the chapters of greatest interest to film history fans will be those that deal with the early years of the studio at the beginning of the 20th century through its glory years in the 1930s to 1950s. Tales of behind-the-scenes scheming and ethically questionable funding techniques are amusing, as are the many brief asides about life on the backlot. One of my favorites told of when a drunk Humphrey Bogart stole a studio bicycle and rode around the deserted artificial streets singing loudly and profanely about how much he hated the head of the studio, just for the joy of hearing his refrain echo off the fabricated storefronts. The physical details of this labyrinthine property provide much interest as well. One particular portion tells of a secret hidden crew lounge cobbled together between the walls of the studio’s Brooklyn brownstone street. Also of great interest were details about specific props, sets, and lots used for legendary and beloved cinema classics like Casablanca and Sunset Boulevard. There is more film history and lore within the walls of the Warner Bros. studio than one person could ever fully uncover. This book sent me on a flight of fancy imagining what it would be like to wander through the vaults, cavernous sound stages, and out-of-place outdoor sets of a major Hollywood studio. Bingen’s book allows us the vicarious opportunity to take that journey.